But there is a slight problem: AF#15 and the first story in ASM #1 do not look like pure Ditko, but rather a combination of Kirby and Ditko. How can that be? What is the story? When you look into how the early Marvel superheroes (1961-63) were created, you encounter several problems, the first of which is that no-one really remembers anything. 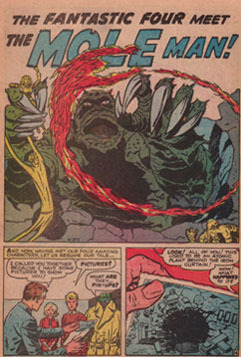 The three major architects of the Marvel universe are Stan Lee, writer and editor, along with Jack Kirby and Steve Ditko, artists and creative wellsprings. Stan Lee is notorious for his bad memory, Jack Kirby is dead and Steve Ditko has not talked to anyone for the last 30 years. At the beginning of the 60s the market was slowly starting to recover from the shock that was the comics witch hunts of the 50s, and especially superheroes seemed somewhat popular. DC (publisher of Superman and Batman) successfully published the Justice League of America and Martin Goodman (the publisher at Marvel) decided that if DC could do it, then why not Marvel? 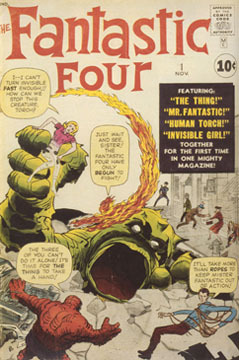 Kirby and Lee produced Fantastic Four (‘FF’) #1, which kickstarted what we today know as the Marvel Universe. 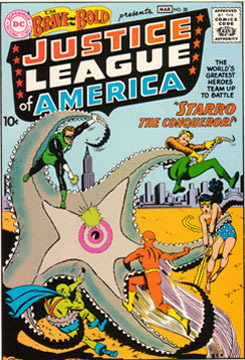 And if anyone should be in doubt as to where Marvel got the idea, they need only compare the cover of Brave and the Bold #28 (the first appearance of the Justice League of America) with that of FF #1. After FF followed Hulk, Thor and Iron Man, all of them drawn by Kirby, though sometimes only in layout. Stan Lee’s role was undoubtedly more that of editor, channeling Kirby’s creative torrents, than of the works’ author. Who initially had the idea for Spider-Man is hard to say. 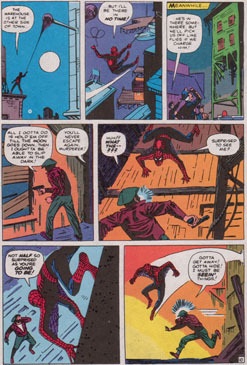 In the comics anthology Origins of Marvel Comics, written by Stan Lee in 1974, Lee writes that his fascination for the 30s pulp hero The Spider that provided the initial inspiration. Whether this is a later interpolation is not known. In the same book, Lee also writes that AF was going to be cancelled and that this was the reason why they took a chance on Spider-Man in the last issue. The problem with this explanation is that, at the end of the Spider-Man story in the issue (the comic also includes three other stories, 3, 5, and 5 pages long, respectively), there is a blurb saying Spider-Man will appear in the next issue of AF – an issue that was never published! This blurb has been removed from every reprint of the story since. According to some sources, Jack Kirby and Joe Simon (his creative partner through the 40s and 50s) had conceived a character called Spider-Man who never saw publication, but it has proven impossible to substantiate this claim. Whatever the case might be, Jack Kirby started drawing the character for Marvel as usual, but never did more than a few pages. We do not know why. But as Stan Lee points out, ordinary people were not Kirby’s primary strength as an artist, which is why Ditko was attached to the series. However, if one looks at AF#15 and the first story of ASM #1, it is obvious that Ditko drew them on the basis of Kirby layouts. 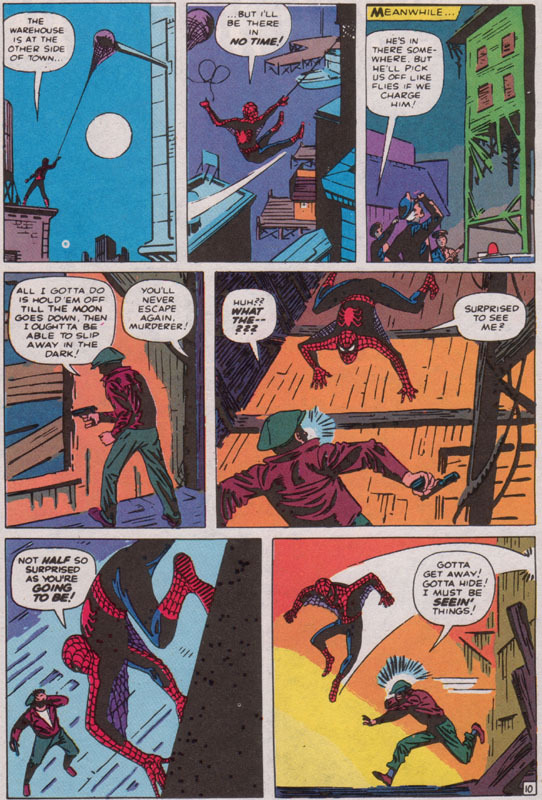 How much Ditko added or changed is almost impossible to determine today, but pages 7, 10 and 11 of AF #15 and pages 7-12 of ASM #1 are clearly laid out by Kirby. 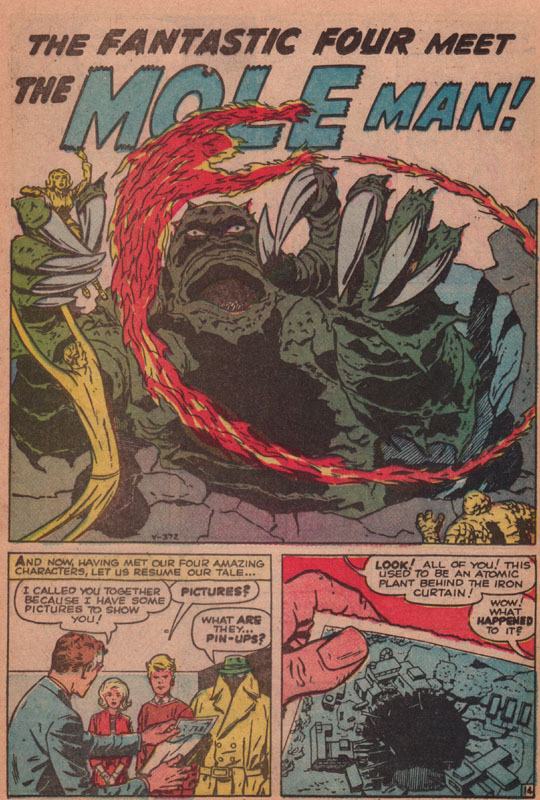 Who knows, maybe copies of Kirby’s original pages remain buried somewhere in the bottomless archives at Marvel? We can therefore conclude that the only foundational, classic hero Kirby never put his mitts on was Doctor Strange, drawn by Steve Ditko. Or not..? Blake Bell, Mark Evanier and others chime in — read the debate! Images: Kirby’s layout/pencils to one of the splash pages of FF#1 & the one of those to the first story of ASM #1 by Ditko… and Kirby; the covers to Brave and the Bold #28, by Mike Sekowsky and Murphy Anderson, & to FF#1; Page from ASM #15, ostensibly pure Ditko, but it is too awkward to fully be by him. 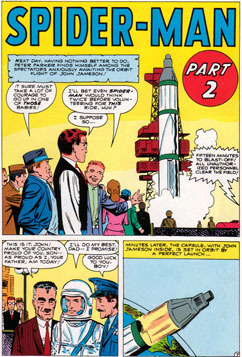 The 3/2/2-construction reveals that is must have been drawn over Kirby layouts. UPDATE: go here for pictures of the original art to the Spider-Man story in Amazing Fantasy #15.